Product #15957 | SKU DRAGONFLY | 0.0 (no ratings yet) Thanks for your rating! 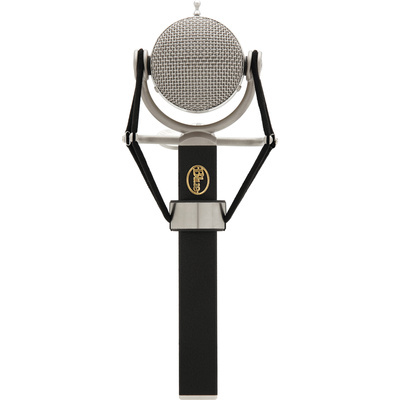 The Dragonfly Microphone from Blue features a cardioid studio condenser design and can be used with vocal and general instrument studio recording. It contains a pressure-gradient, single membrane large diaphragm capsule and uses a 6-micron thick mylar film. The film is sputtered in a mixture of pure gold and aluminium and is enclosed in a rotating spherical grill. The rotating grill allows for optimum mic placement in small spaces and for maximum sonic quality. The microphone offers Class A discrete circuitry and transformerless output, resulting in a clean, quiet audio signal path with minimum colouration or noise output. The Dragonfly's neutral signal and wide frequency response allow the microphone to record vocals, drums, percussion, electric guitar, and bass, as well as saxophones and stringed instruments. The cardioid polar pattern is effective on rejecting off-axis noise due to room ambiance, monitors, instruments, and similar items.